This baby-friendly “MP3 player” introduces little ears to tunes from classic composers like Mozart and Vivaldi. The large button makes it easy to toggle through seven familiar melodies, while the colourful lights that dance across the screen are sure to delight and amuse. 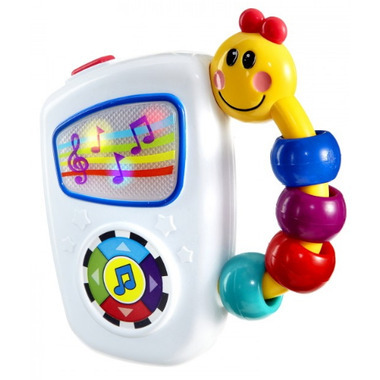 The beaded caterpillar handle is easy to grasp, so babies can take their tunes along anywhere! Suitable for ages 3 months old and up. My 3 month old Grandson just adores this musical toy. Great in the car. I wanted to like this but the button was too hard to press for my baby. My baby likes it too but I had to press the music for her every time, it's even hard for me to turn it on, I think I just got a defective one. Baby is going to love it! Our son got this as a gift at Christmas when he was 6 months old and it was an immediate favorite. He loved being able to press the button (huge area for little hands to target and the noise/flashing lights. We like it because it's small and portable - it's a main staple in the vehicle now and has even been on a number of plain trips with us. As he's gotten older he's continued to like this toy; he'sable to hold onto the handle and spin the beads now that his hands are bigger. Continues to be a good source of amusement and distraction, highly recommend this toy! Initially got this as a gift and our little one LOVED it! We now give it to everyone as a baby shower gift! Huge hit! My nine month old daughter's absolute favourite toy since she received it as a gift three months ago. We take this thing everywhere! It's easy for her to grasp and push the button... She evens tries to sing along to the music. Two volume levels and the least annoying sound toy we have. Highly recommend!